After installing WinCraps, I dragged the game's executable file to my desktop. But when I try to run the game I get something that says "runtime error". What's with this? This error should only appear with the classic or older versions (the pro version should just show a warning). By dragging the main game file to the desktop, you isolated it from its needed support files. You should keep all of WinCraps original files together in the same folder. (New files that you create such as Auto-bet and Dice Roll files can be located anywhere.) The same is true for shortcuts. Any shortcut you create needs to start in the folder containing the main game file as well as its support files. 2) Right-click the main game file WinCrapsPro23b.EXE. A menu will appear. 3) Select SEND TO. A second menu will appear. 1) Right-click your mouse pointer while pointing over an open space on your screen (desktop). A small menu will appear. 2) Select NEW from the menu. A second menu will appear. 3) Select SHORTCUT. A "Create Shortcut" box will appear. 6) Enter a name for your shortcut such as "WinCraps"
A shortcut will then appear on your desktop. Just double-click it to start the game. Will WinCraps run on Windows XP, Vista, 7, 8, or 10? Will WinCraps run on my Mac? Yes. Although WinCraps is written for Windows, many folks are running it on their Macs using Windows emulation software such as Parallels or VMware Fusion. Is there a way to automatically play the same rolls over again so I can compare different methods? 1) Provide a seed to the random number generator and re-enter that same seed each time you want to play the same rolls. See RNG in the help file or on the Misc tab of the Configuration screen. 2) Record a dice roll file and replay the file when desired. Select "Dice Roll Files" from the Action menu or find it in the help file. How can I get the bankroll indicator to reset so I can start over? Select "New" under the Game menu to reset the table. 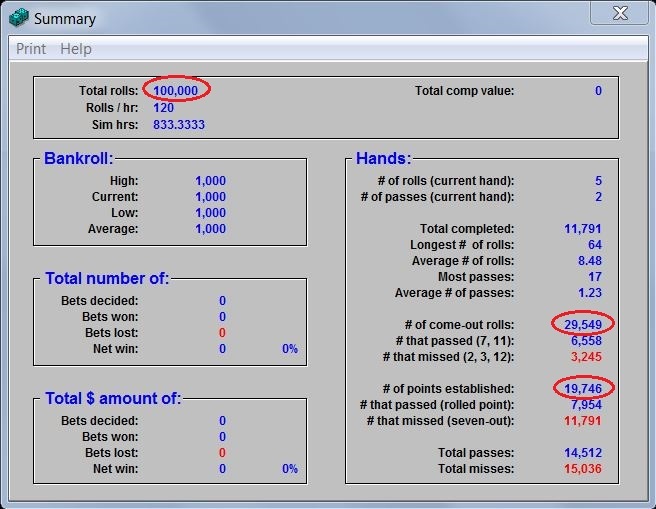 Your initial bankroll will be determined by the settings on the Bankroll tab of the Configuration screen. The Configuration screen is also found under the Game menu. If you don't want to start a completely new game/session, you can make bankroll adjustments through an ATM on the bankroll tab. I'm trying to write some auto-bets in WinCraps Classic but I can't get the game to log any of the lines I make. Can you advise? To log an auto-bet, first modify the type of line that you want (Condition, Action, etc. ), then click on the command button next to the line. For instance, to log a condition line, click on the button to the far left marked "Condition". When you do, the condition line will turn red and the mouse-pointer will change. Next click inside the large logged bets box at the point where you want the line to appear. Voila! I'd like to make a Place 6 or 8 bet for less than $6, but each time I try, the program changes it to $6. The same thing happens when I try to make Place 4,5,9,or 10 bets for less than $5. Is there a setting to allow me to do this? Yes, absolutely! Navigate to the Auto-play screen (found on the Action menu) and set the "Auto-adjust bet amounts" feature to "manual". With "manual" selected, the game will allow you to bet any amount you want (as long as it's not less than the minimum bet or more than the maximum bet set on the Configuration screen). With either of the auto options selected, the game will automatically adjust any amount you bet to an amount that squares with the odds. At the casino I heard a dealer ask someone if he wanted to come "Down with odds". What does that mean and can I set WinCraps up to simulate it? In WinCraps Classic, check both the "Auto-Take Full Odds" and "Auto-Remove Place Bets" boxes. In WinCraps Pro, select the desired player(s), then check both the "Auto-Take Full Odds" and "Auto-Down Place Bets" boxes. How do I set the probability matrix to roll the dice with an SRR of 6.143? SRR is a term used by many "dice-influencers" which stands for Sevens-Roll-Ratio and is simply a different way of expressing the probability of a seven. Normally the seven appears an average of once every six rolls and the probability is expressed as 1/6 = 16.67%. However, with SRR just the denominator is given, so the normal SRR is 6. A larger SRR value would mean that sevens are appearing less often and a smaller SRR value would mean that sevens are appearing more often. There are several ways to enter an SRR of 6.143 into WinCraps' probability matrix. One way is to select the option: "Show as # rolls out of" then enter 6.143 in the adjacent box and press the return key (see item B in the diagram below). All the figures you see in the matrix (next to the cyan colored boxes) will be converted to ratios of rolls out of 6.143 with the value next to the 7 showing 1.024. Next you need to change the probability so that the number next to the 7 reads 1.000 (see item A below). Of course, you could just enter 1.000 directly and you'd be done. However, it depends on how you think obtaining an SRR of 6.143 is possible. If, like many dice-influencers, you believe that the probability of the dice can be changed by throwing them such that they rotate about an axis, then you need to adjust the values at the bottom of the screen next to "1st Die" and "2nd Die" until the value next to the 7 reads 1.000. To really get this right you should keep opposite faces of each die (such as the 5-2) the same. This will ensure that the probabilities of the other numbers are also properly set. So for instance, for the 1-6 axis you would equally raise or lower the values next to the 1 and the 6. Using a little trial and error on both dice with various combinations of the three axes you should be able to find the values you need. You can make this a little easier by clicking the Option menu and selecting "Compute percentage dice about an axis" (see item C below). In the second diagram below you can see one example of dice axes and shooter's effectiveness that will result in an SRR of 6.143. Another way to enter an SRR is to convert it into a normal expression of probablity and change the matrix to reflect that percentage. So to convert an SRR of 6.143, divide 1 by 6.143 and you'll find that the probability of the seven is 16.278%. 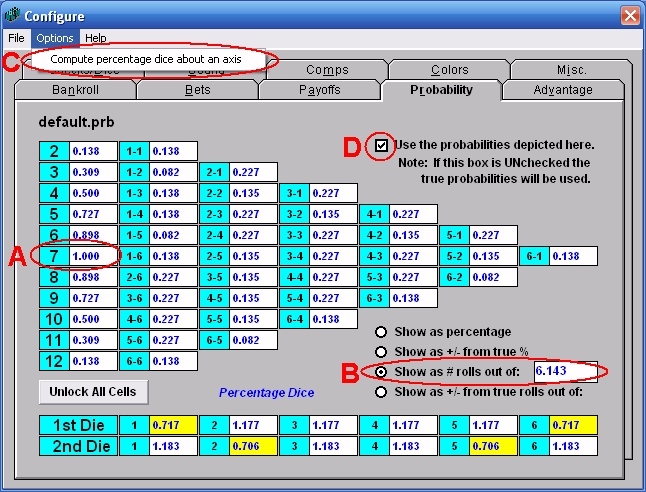 Now simply select the option: "Show as percentage" and change the probabilities of the two dice until the value next to 7 reads 16.278. In all cases, remember to activate the probability matrix when you need it and deactivate it when you don't need it using auto-bets, hot-keys, or manually with the check box shown next to item D below. I have some auto-bet files written for WinCraps Classic which use flags. How do I convert these files to run in WinCraps Pro? How do I write an auto-bet script that only makes two Come bets? I've configured my WinCraps Pro table with several players and assigned each of them an auto-bet script. 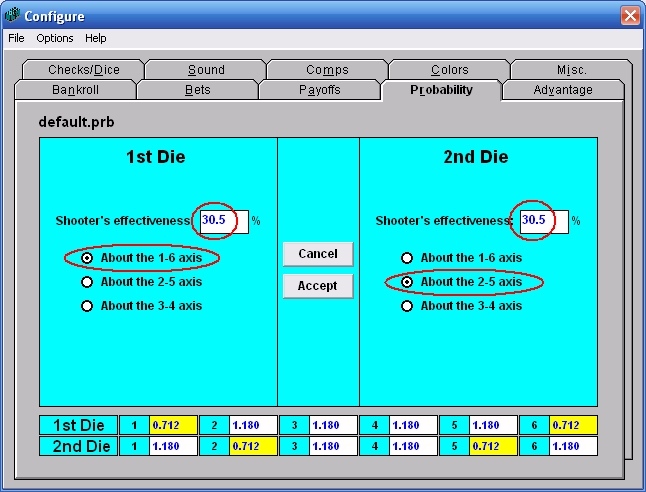 Two of the scripts contain the "Pass the dice" command, yet one of the players still ends up shooting the dice. How can that be? This has to do with the order of script processing. Remember that (except for initialization) auto-betting takes place AFTER the dice roll and that scripts are processed beginning with Player1 (in the upper-left position as viewed by the stickperson) and proceeding counter-clockwise to Player8. So for example, let's say Player1 and Player2 both have scripts with "Pass the dice" commands. Player3 is the shooter and sevens-out. Winning and losing bets are processed first and then the dice are passed clockwise to Player2. NOW the auto-bet scripts are processed. Player1's script is processed first. His script says to "Pass the dice", but since he doesn't have the dice, his command is ignored (unless he was given permission to pass the dice for other players). Next, Player2's script is processed. It also says to "Pass the dice" and since he does have the dice, he faithfully passes them to Player1. Since Player1's script has already been processed, he gladly accepts the dice and shoots. Player1 will only pass the dice if his script executes the "Pass the dice" command again on a subsequent roll. So how do you prevent Player1 from shooting at all? You should use the AutoPass feature. The "Pass the dice" command is best reserved for those times when a player already has the dice when his script is processed, like when he's been shooting but doesn't want to finish his hand. The AutoPass feature on the other hand, operates independently from auto-bet script processing and will ensure that Player1 always passes the dice whenever he's offered to be the shooter. Where can I find the average number of rolls to resolve a point? To be absolutely precise you would need to ensure that the table didn't have a currently unresolved point. Also bear in mind that this answer strictly applies to the actual rolls you've experienced at the table (in this case 100,000). The theoretical average number of rolls to resolve a point is 3.5636. How do I write an auto-bet script that plays multiple sessions? You need to add the Start New Session command to your script. The trick is knowing where to add it and what things (if any) need to be done to initiate the new session. As usual, this depends on how you write your script. It's not meant to be confusing but rather flexible. So now your script's written and you're ready to activate it, but before you do, think about the data your simulation will produce. Do you want it to be co-mingled with other data you may already have collected from other simulations or game play? If this is the case, then activate your script and carry on rolling. Or do you want your data to stand on its own to help answer some fundamental questions? If this is this case, then you'll need to select NEW from the Game menu on the main craps table and UNcheck the box marked "Preserve previous sessions data" when queried. Then it's time to activate your script. Don't worry, if you already did, then it'll be re-initialized. 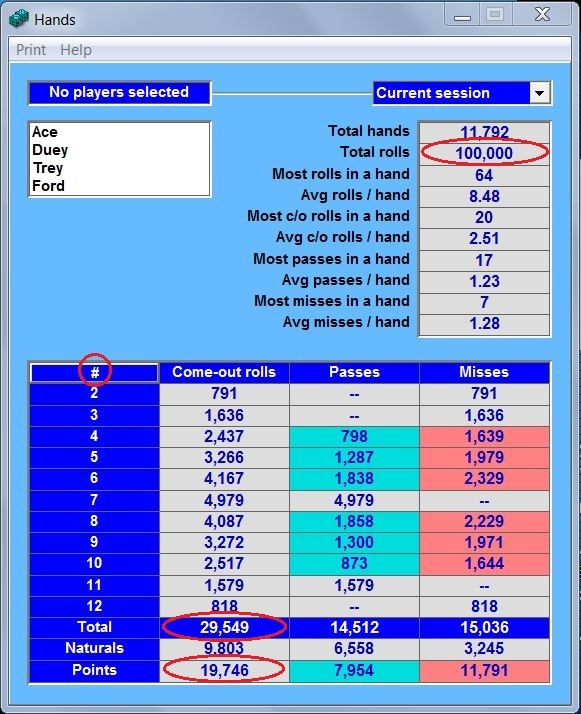 When your simulation is complete, your multi-session data can be found in a number of places:The Summary, Hands, Roll Totals, and Bet Results screens can all be selected to display "All sessions" and the Sessions Log will show a selected set of data in a list or a histogram for each and every session. Additional data for the Sessions Log can be collected and displayed using checkstacks 0 thru 19 (see Sessions Log in the Help file). The Events Log (if activated) will also show what transpired, but for long simulations this is not generally recommended as it can consume a lot of disk space (and after all, do you really need to know what happened on the 837th hand in a 2 million-roll simulation?) Lastly, your script can be written to output data to one or more text files. Be sure to check out the free Auto-bet scripts here, many of which are written for multiple sessions.